The folks at the Protein Milkshake Bar reached out to me and asked me if I’d like to try a sample and do a review. They let me choose my flavor, and honestly, it was a difficult decision choosing between Rocky Road and chocolate mousse for me. 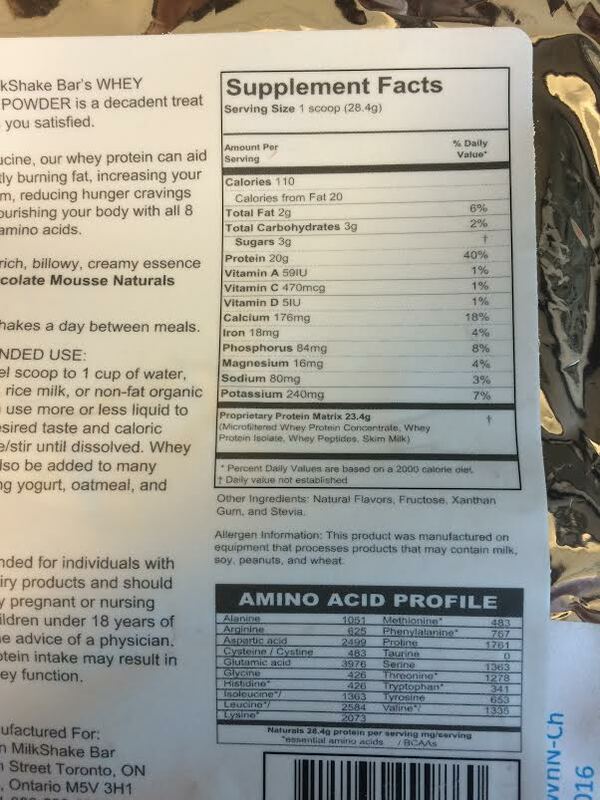 So, I got my sample and the first thing I did was check out the nutrition. I can get behind that nutrition – just wish there was some fiber in it! I do believe all of the flavors work out to be 3pp for a serving. I blended mine with 1/2c. unsweetened almond/coconut milk and ice (0pp), 1tsp chia seeds (0pp) and 2tbsp PB2 (1pp). The flavor was great! I tasted it before I put the PB2 in it and the best way to describe it is like a milk chocolate hot cocoa, but thicker and creamier. The PB2 made it very Reese’s like. Also, there was no terrible chalky after taste that I think a lot of protein powders have. A huge selling point for me is this was a really clean flavor that didn’t taste like the typical protein powder or artificially sweet (in fact, it’s sweetened with Stevia). I typically end up adding yogurt, bananas, fruit, etc. to mask the protein powder flavor which means I’m usually adding tons of calories. I love that I don’t have to do that with this one.